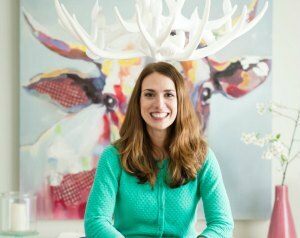 Are you ready to get your family organized? 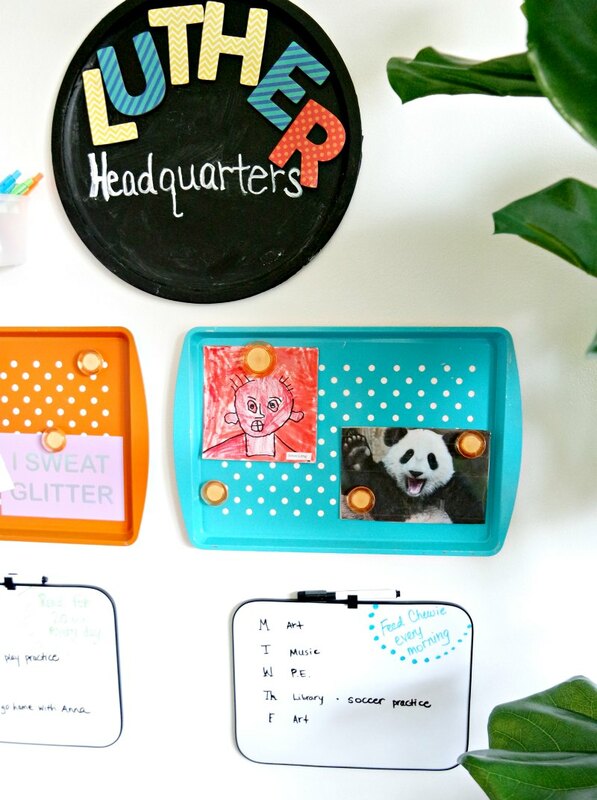 This DIY Dollar Store Command Center is exactly what you need to help your busy kids stay on track and organized! 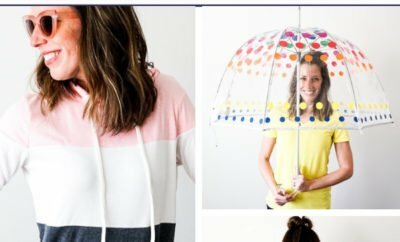 I bought everything at the Dollar Tree for just $1 each, but you could find these things at most Dollar stores (Family Dollar, Dollar General, 99 Cents Only, etc). For less than $20, I was able to create this entire family command center. Now, my kids know what the schedule is for the week, they have a spot to keep their important papers and folders, and we haven’t lost a library book since we created this command center. Bonus! Watch the video and follow the instructions below to create your own! Like I mentioned, I purchased all of my supplies at Dollar Tree, but you can find similar items at just about any Dollar Store. In case you don’t have a Dollar Store near you, I’m also including links to purchase these items on Amazon. Just keep in mind that my entire Command Center for all three kids was less than $20 at the Dollar Tree. 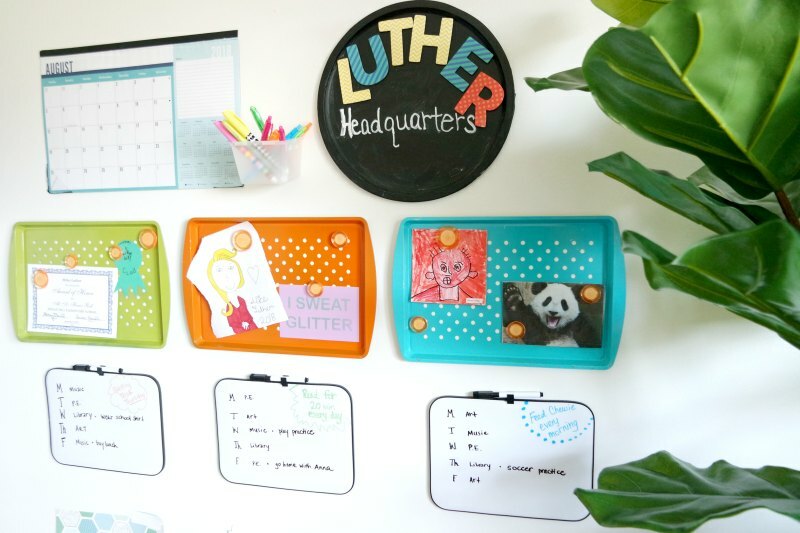 I have three kids, so I purchased enough for each child to have their own magnetic board, dry erase board and container for all of their files and library books. One for each child. This will become their magnetic board. →Click here to purchase on Amazon. You can use this to customize your Command Center. You’ll only need one. One for each child. This will become their cubby/container for their folders, papers and library books. I purchased four for each child, but you can have as many or as few as you want. Spray paint for customizing magnetic boards and flower boxes. Clips to clip pictures or important papers to bottom of flower boxes. 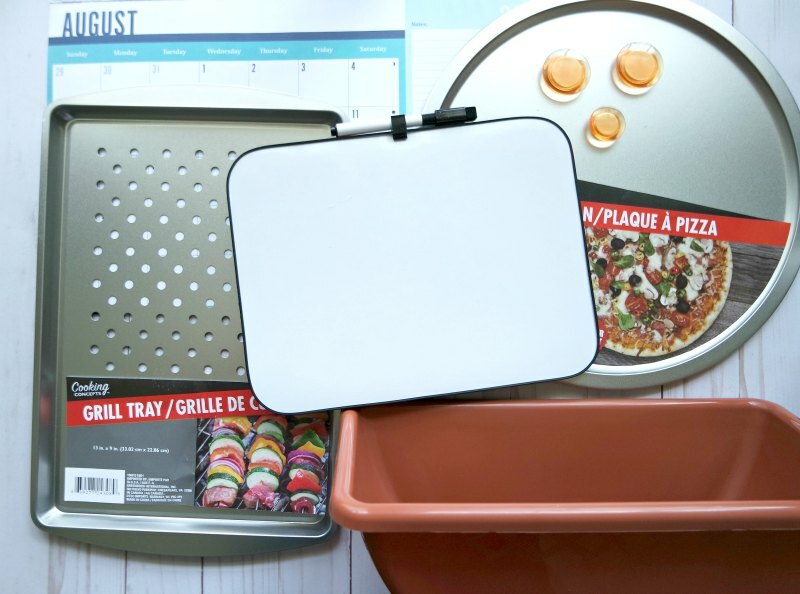 Magnetic letters to customize your pizza pan. 3M strips for hanging your command center. You can also use a hammer and nails. Pens/pencils for writing on wall calendar. 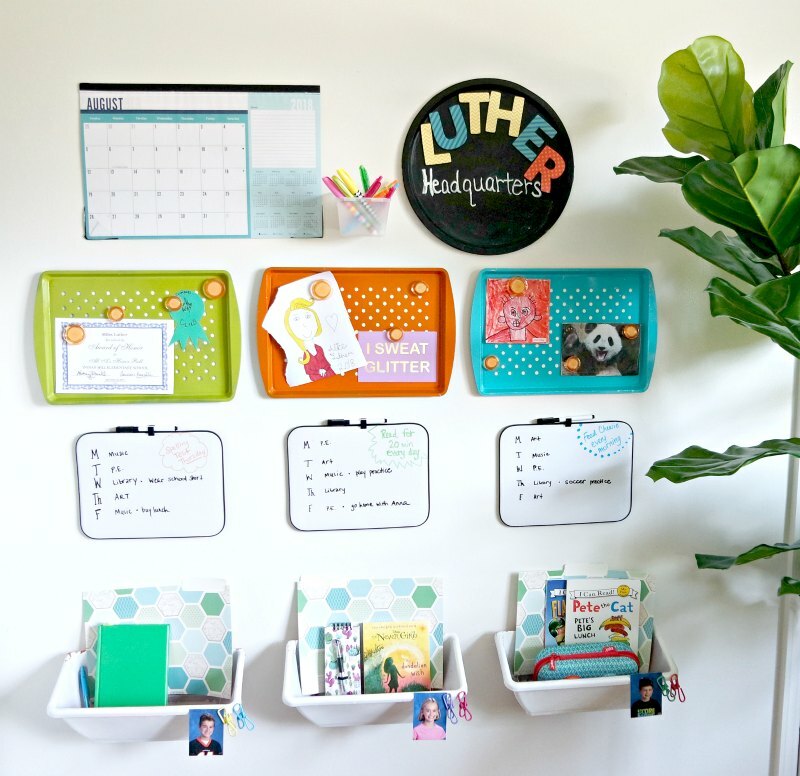 While it’s completely optional, a little prep work can take your Dollar Store Command Center from functional to FABULOUS and functional! 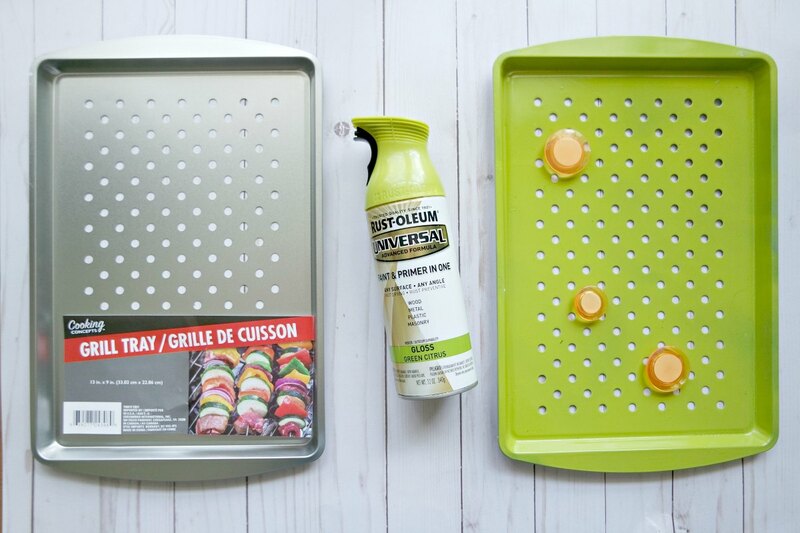 Specifically, you can use spray paint to paint your grill trays (or baking sheets). I did a different color for each kid, but you could easily do the same for all of your kids. 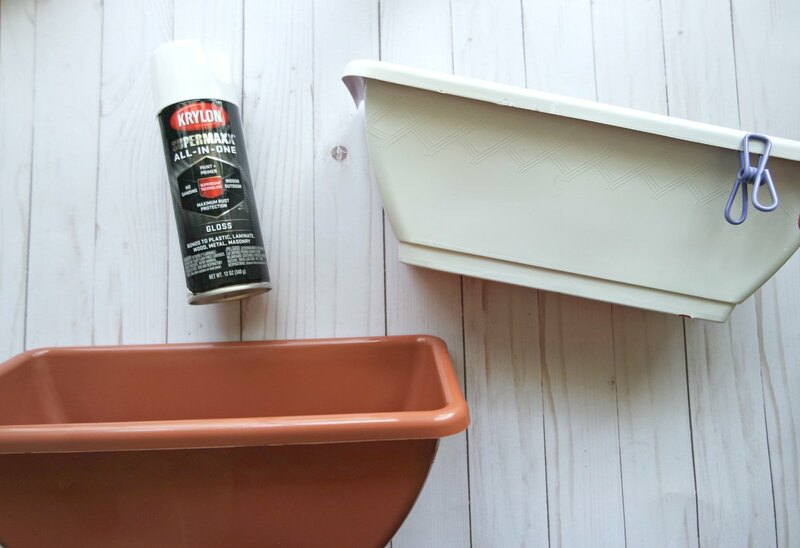 I also used spray paint to take my terra cotta flower boxes from brown to white. This was completely unnecessary, but I felt like it just helped them look a lot better. And – finally – I used black chalkboard paint and some large, magnetic alphabet letters (and a chalk pen) to make a custom sign for our command center. Of course you could skip right over this step if you wanted to! One of the hardest parts about assembling your Dollar Store Command Center is deciding where to put it. You can put everything together in one wall like I did. 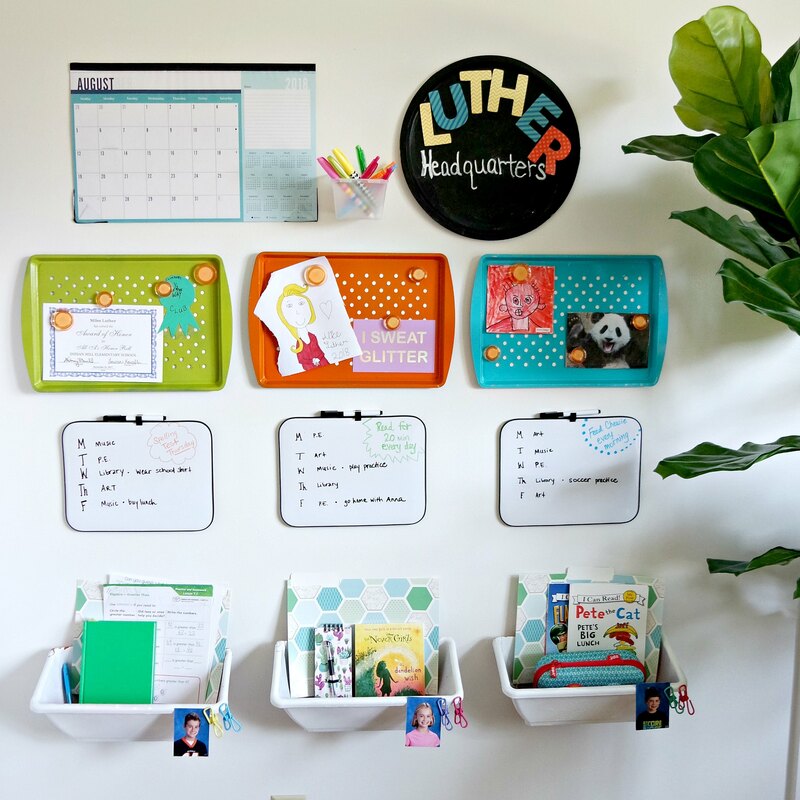 You can find a different space for each of your kids and split it up into several mini command centers. Maybe every child’s goes on the back of their bedroom door for example. 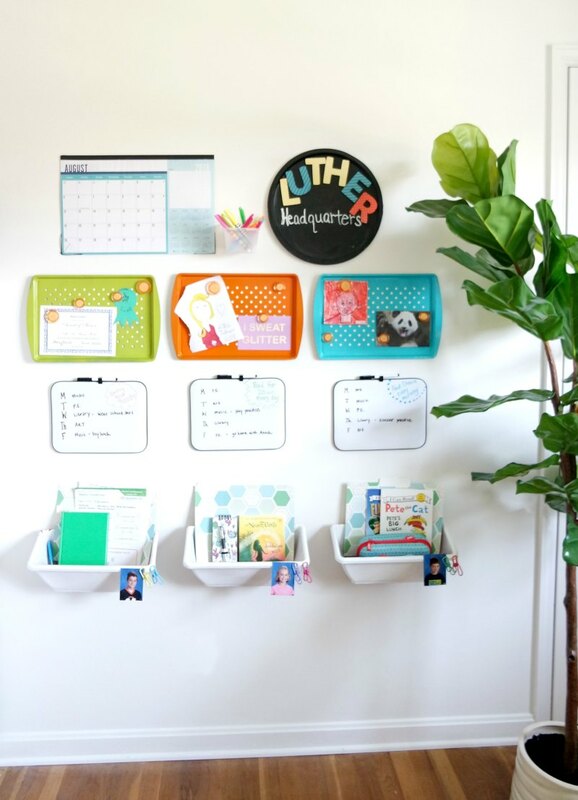 Once you have a spot for your Dollar Store Command Center, start hanging it up. I used 3M Strips, but you can also use a hammer and nails. I put my middle pieces up first and then built it up, out and down from there. Don’t panic if you have to rearrange things a few times. I ended up moving things quite a bit before I finally stuck things on the wall. Pro Tip! 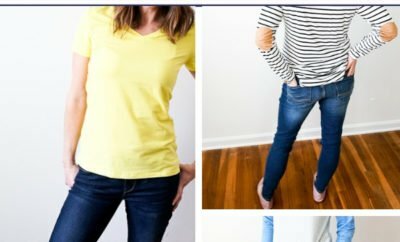 Lay everything out on the floor before you hang it on the wall. That will help you decide placement and spacing before expensive 3M strips (or holes in your wall) get involved. 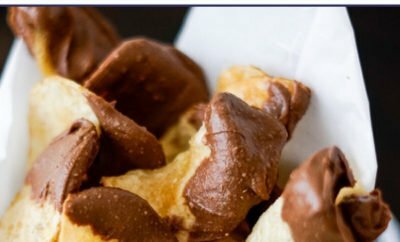 For us, we put the containers at the very bottom. This makes it easy for my kids to unpack their bags into these bins after school and keep their homework and important papers here during the week. We also clipped their school picture to their bin so there’s never any confusion about which is theirs. Just above the containers are the dry erase boards. 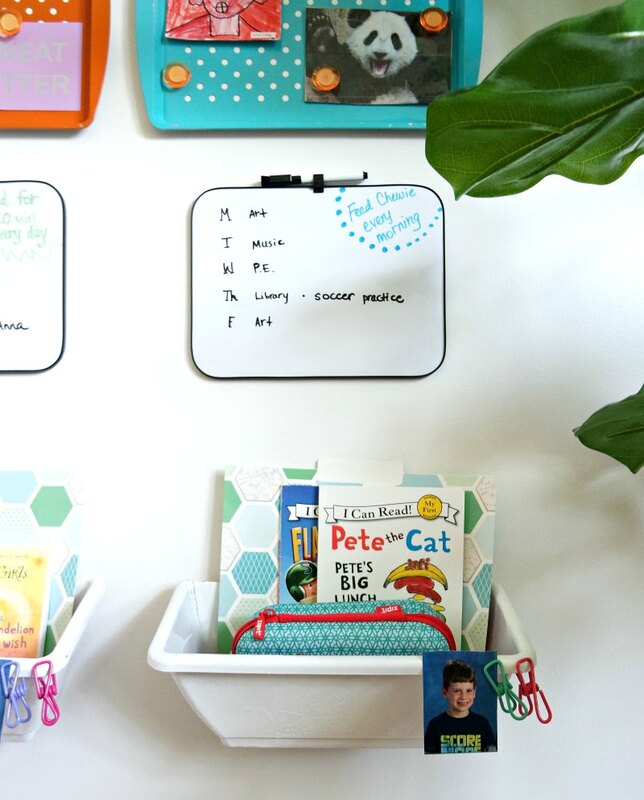 The kids can see their weekly specials schedule (and can remember when they need to wear gym shoes or bring their band instruments), and I can write test reminders or chore reminders to help them remember things. Let’s be honest – I’m the one that needs to remember these things. HA! 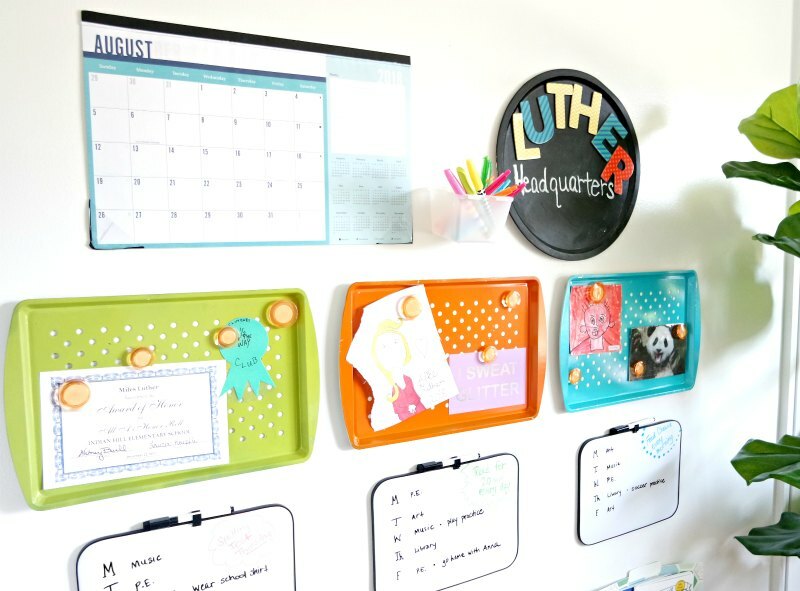 And above the dry erase boards are their magnetic boards. They get to pick what goes on these boards. Simon chose a self-portrait and a picture of a Panda (his favorite). Alice has a fun quote, and Miles has his school awards certificates. It’s fun to see what they decide to hang up here and when they decide to change things up. 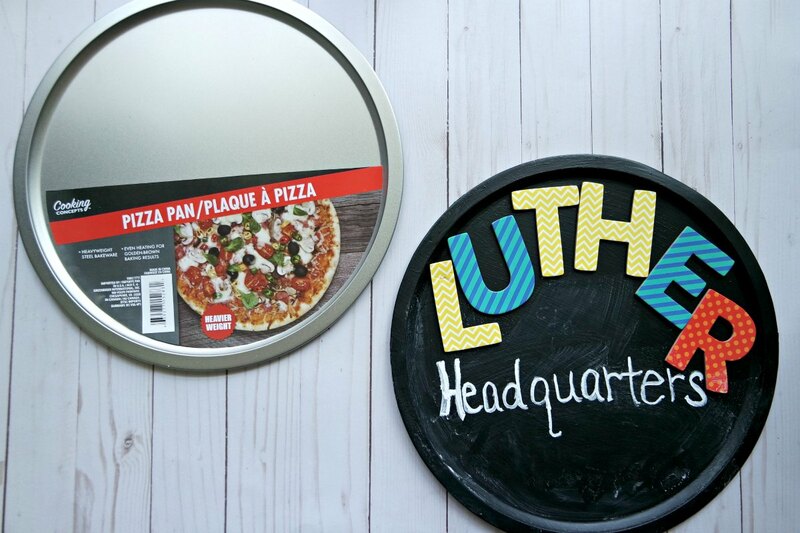 And at the very top we have the family calendar, a container of pens and markers and a fun little Luther Headquarters sign that I made out of the pizza tray. All-in-all, I’m thrilled with how this incredibly simple and inexpensive Dollar Store Command Center turned out. If I had it to do over, the only thing I would add is a small hook below everyone’s flower box cubby to hang their backpack. I still might go back and add those, and I’ll be sure to keep you posted if I do. But if your kids are having trouble, just make sure that you’re using it yourself. And give them lots of reminders. Maybe you help them unpack their backpacks and make sure to put things in the correct spot after school each day or before bed each night. Set aside time on the weekend to look at the next week’s calendar together. 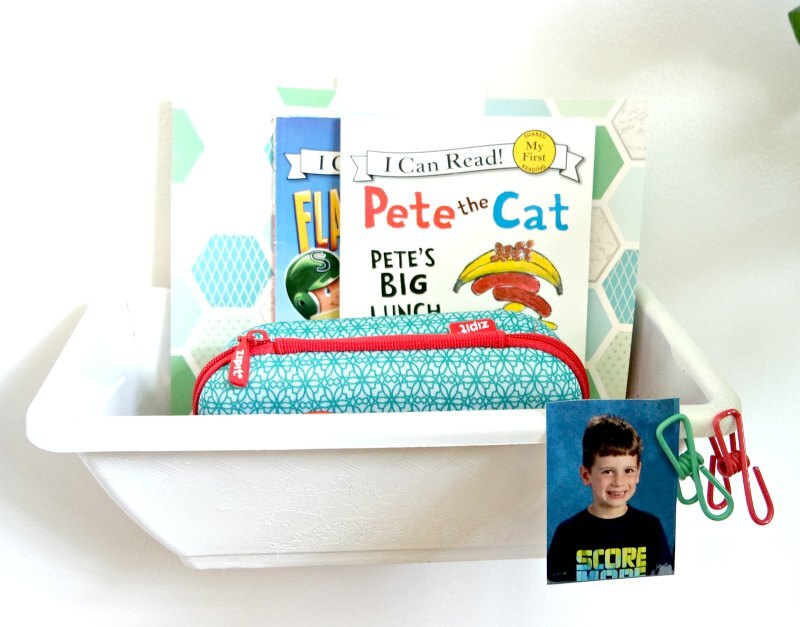 Before you know it, your kids will be the ones reminding YOU to use the command center! Looking for MORE Command Center Ideas? Looking for more command center inspiration? 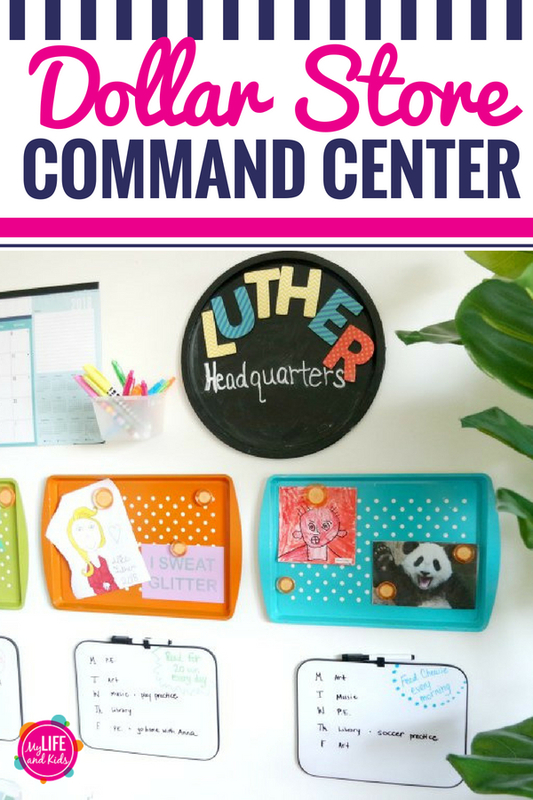 Click here to see some of my favorite command centers. 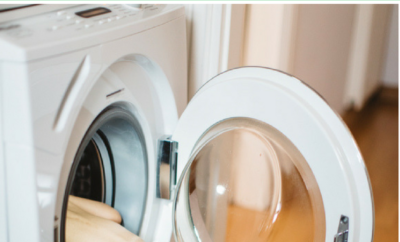 And since we’re getting our kids organized, you might as well click over here to see 21 of the very best Chore Charts for kids. 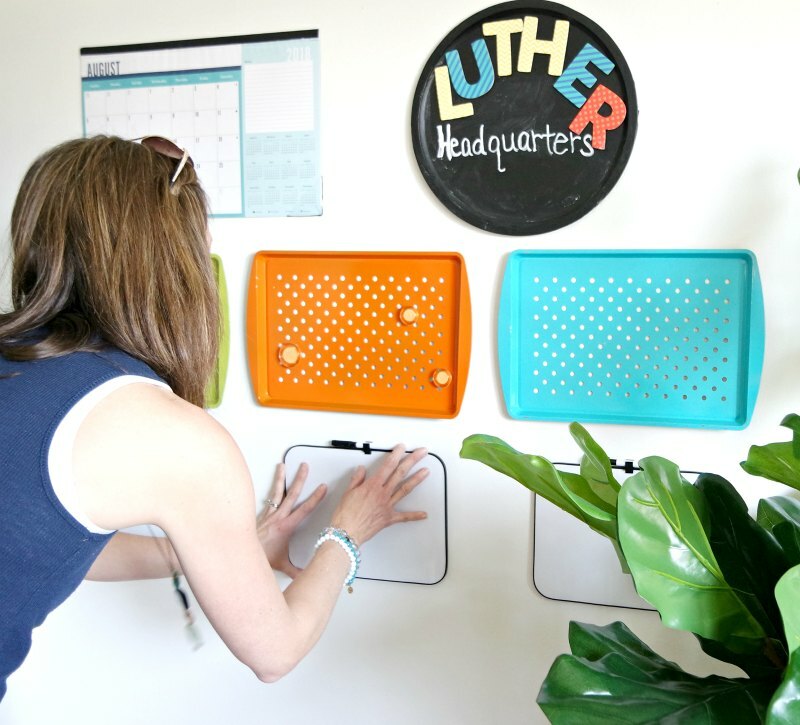 Nothing could be better than incorporating your new chore chart into your new Command Center!